1) 2 inches is about the best height to mow grass. Shorter grass requires more water. 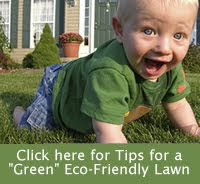 And leave the clippings as a natural fertilizing blanket. 2) Get a sprinkler timer and set it for the early morning hours. Less water will be wasted due to evaporation. 3) Make sure that you aren't watering the road or sidewalk. Adjust your sprinkler heads. 4) Use a shutoff nozzle on your garden hose. Water flows from an unrestricted hose at a rate of more than 12 gallons per minute. 5) Get drought-resistant plants and you could save up to two thirds of the water you'd use on thirstier plants. 6) Create a Xeriscape. An acre of Xeriscaped land can save about 850,000 gallons of water annually. 7) Water only once or twice a week. Most outdoor plants are over-watered by 50 percent. 8) The type of soil you use makes a huge difference in the amount of water your garden needs. Find out what kind of soil you have so you can water accordingly. 9) The type of fertilizer you use can also reduce your garden's watering needs. Just 5 pounds of organic compost mixed into 100 pounds of soil can hold an additional 25 gallons of water. 10) Go natural. Indigenous plants and those that grow easily in the local area should require less water. The Green Blue Book is loaded with other water-saving hints and tips. Give it a read!